Get your fashion, style, hair, beauty and lifestyle business online and in front of super stylish, fashion forward potential customers! Perfect for brick and mortar stores, local services and online businesses. 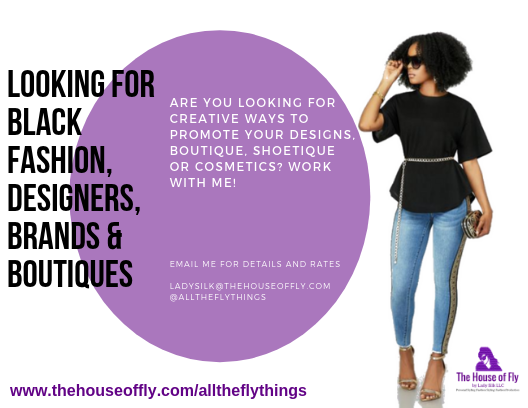 ​Join the All the Fly Things Fashion, Style and Beauty Directory and attract new clients and customers with a trusted online presence. Email based Q&A style interview about your product, service, or event complete with 6-15 photos, link to website and social media shares. We can also schedule a Instagram or Facebook Live Fashion Talk if you are interested! Provide a sample of your merchandise or product, invite me to your event, or allow me to try your service and receive a write up on the blog. Complete with photos, links to your website, and social media shares. Can't provide a sample? That's OK, I can still write an informational blog post about your brand, product, service or event complete with photos (provided by you) links to your website and social media shares. Show us what you got! Let's do a Facebook/Instagram Live Walk Through Interview where we chat and show both of our followers your new shipments, the hottest selling merchandise and sale/clearance items or whatever you feel would get customers in the door or on the website! It's a great way to gain new followers and show potential customers the inside of your boutique and what type of clothing, shoes and accessories you sell. Got a new shipment in and want to highlight it? Contact me to get the item featured on the blog and social media (Instagram, Facebook, Pinterest and private fashion, shopping and blogging groups) with a link to buy. Live social media interview where we can discuss you, your brand, product or event in depth. An intimate Q and A that will include 3-5 questions and promotion on social media. Great way to gain new followers, increase engagement and answer questions about your brand. I will produce a mini style presentation for new inventory, Valentine's Day Date Night Looks, Holiday Party Outfit Ideas, Fall and Spring Fashion Trends, and etc. I can use my own models, those provided by the boutique or mannequins. ​Make your customers feel great in this exclusive session with a stylist! Customers will learn how to achieve looks appropriate for their body shape, lifestyles and budget and will want to play and explore their new found knowledge with your merchandise. Topics can include things like How to Wear the latest Trends, Date Night Looks, Day /White Party Ideas etc., and will include a Q&A question with a stylist. This is a great marketing tool to keep you steps ahead of the competition, gets customers into the store and helps drive sales! Customers love to see how garments look on REAL bodies- does the fabric move and stretch when they walk? Is the fit true to size? Is there a certain way to wear it? And most importantly- how will it look on Instagram?! I will style 3-5 outfits of your clothing on a model and share via social media. It' a fun way to show off your merchandise to potential clients and followers and add more fashion content to your feed.